Do you remember watching Kukla, Fran, and Ollie, a wonderful puppet show that was one of the first children’s programs on TV? I have only fuzzy memories of the show, but wish I could remember it more clearly, because from all accounts, it was one of the most creative, sophisticated, and entertaining kids’ shows in TV history. Created by puppeteer Burr Tillstrom, who handled all the puppets on the program, the show debuted in 1947 on the NBC station in Chicago, the source of so many great children’s programs in the early days of television. In 1949, it became an NBC network show and was broadcast nationwide until 1954, when it moved to ABC, where it ran until 1957. Kukla, Fran, and Ollie quickly became enormously popular and was one of the first children’s shows to attract a large adult audience. 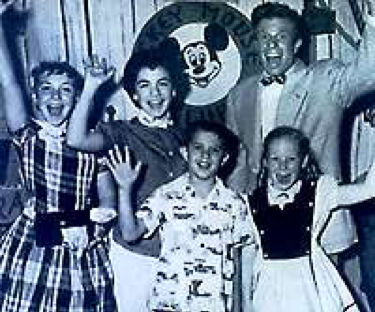 The format consisted simply of host Fran Allison standing in front of a puppet stage and interacting with Kukla and Ollie, the two puppet stars of the show, along with a host of other puppet characters. The secret to the show’s success was that it combined a simple format and seemingly gentle, sweet atmosphere with adult-level wit and sly satire. Amazingly, each show was largely ad-libbed, a fact that most child viewers must have been oblivious to (I certainly was). When you watch old videos of the show today, you can hear the studio crew laughing off-screen during some of the funnier moments. They were apparently as surprised and entertained by the unscripted comedy as the viewers at home were. The puppets on the show were designed in the traditional Punch and Judy style, but they didn’t engage in slapstick, and their personalities were much more nuanced. Kukla was a sweet and gentle clown who served as the sensible though somewhat over-earnest leader of the group. Ollie was short for Oliver J. Dragon, a mischievous snaggle-toothed dragon who often instigated the funnier interchanges on the show. There were several other puppet characters, collectively referred to as the Kuklapolitans. They included Fletcher Rabbit, the town mailman and fussbudget; Madame Ophelia Oglepuss, a former opera diva; Beulah Witch, a liberated witch; stage manager Cecil Bill, who spoke a language that only the other puppets understood; Colonel R.H. Crackie, a courtly southern gentleman; Ollie’s mother Olivia Dragon; and Ollie’s cousin, Dolores Dragon, who started out as a toddler and grew into a teenager during the years that the show ran. Host Fran Allison, the only human who appeared on air, served as straightman to the puppets but could also hold her own during the often-rapid improvised banter. What made Kukla, Fran, and Ollie unique was how well-developed and three-dimensional the puppets’ characters became during the show’s run. Through the spontaneous banter that took place during each episode, viewers learned more and more about the distinct personalities and individual as well as family histories of each of the characters, so that the show created a varied and engrossing world populated by characters that the audience felt they really knew and quickly came to love.